Letter from Minoru Tsutsui to LP RE: writes in enquiry about the cumulative examination system at Caltech. Requests copies of cumulative examinations from his department. [Letter of response from BW to Mr. Tsutsui April 20, 1953] [Filed under LP Correspondence: Box #410, Folder #18]. Letter from Theodore McClintock, W.H. Freeman and Company, to LP RE: in reviewing the manuscript for LP's revision of General Chemistry, he has come upon some repetitious phrasing and offers solutions. [Reply from LP to McClintock March 30, 1953]. [Filed under LP Books: Box 1953b, Folder 1953b.1]. Memo from L. Zechmeister, Caltech, to LP RE: Written in German. 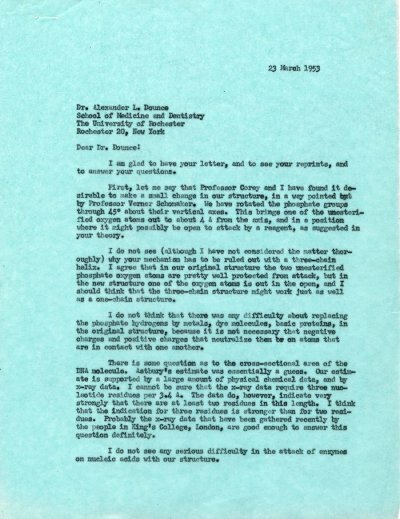 Discusses Dr. K. Freudenberg's letter, from Heidelberg, that was written on March 20, 1953. [Related letter from LP to Freudenberg April 1, 1953]. [Filed under LP Peace: Box 4.001, Folder 1.3].